So, I was scrolling through Pinterest this morning and stumbled across a couple of images that got me thinking 'hey, I can write a post about that!' So, here it is, with the images. Words are an author's lifeline. We use them to create amazing worlds and characters, plots and subplots, descriptions, interactions, and overall awesomeness. Without words, novels would not exist. Unfortunately, some words get overused. 'Says' and 'looks' are two of them and for any die hard reader out there, these two seemingly innocent words can drive a person crazy when used over and over and over again. 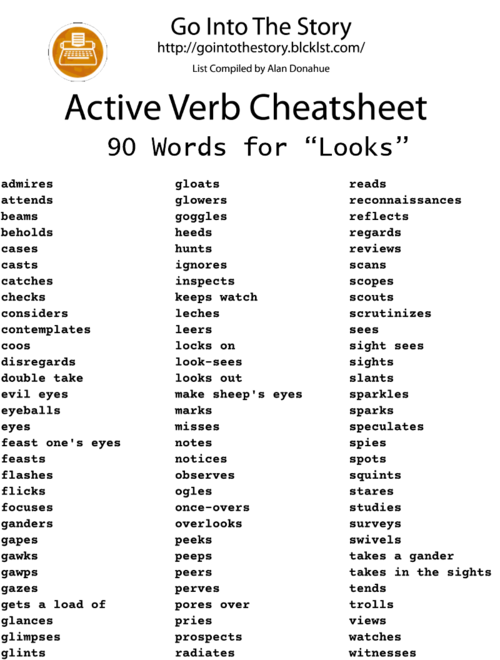 Luckily, there was a genius out there somewhere that created these lists giving us words to replace 'says' and 'looks' and I'm sure there are a ton of other lists out there of amazing words that can replace other words that are overused. 'Says' and 'looks' are my two pet peeves, though, so these are the two that are getting highlighted here. I love that these lists exist out there and strongly urge anyone that is writing to use them, whether you're writing fiction or non-fiction, doesn't matter. Get creative with your words and give the overused ones a much needed vacation! Now, back to my writing cave. Have a great rest of the week and Happy Reading or Writing or whatever interest makes you happy!